Choose your next leading lady or just add to your existing herd from our 2018 lineup, available to add to your herd today! Looking at several, we also offer package deals. Look below to see our newest videos! At McGuire Land & Cattle, we are dedicated to bringing you the best possible registered Longhorn cattle with proven and time-tested genetics, wonderfully gentle dispositions, loads of color, horns of all types, and show winning conformations. We have longhorns to meet everyone's needs. Longhorn's are known for their distinct horns, which can extend out over 10 ft! These remarkable cows are also known for their diverse coloring. Longhorn investing requires very little involvement on your part. In fact, this particular breed of cattle offers numerous benefits; they have a natural immunity, which has been developed over centuries. This means fewer veterinarian bills and less maintenance for the investor. The breed also naturally produces less fat, which is great for today's health conscious public. 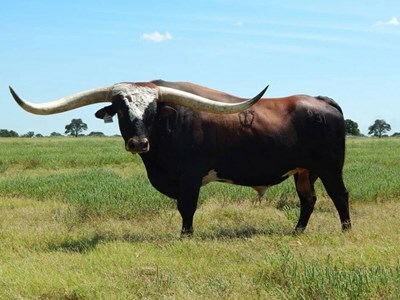 We offer superior quality Texas Longhorn cattle for sale. Browse through our web site and contact us to start or add to your herd today! With over 30 years experience, we are here to serve you. 2018 Horn Showcase Total Horn Winner: 105.6875"
2018 Horn Showcase Composite Winner: 216.5625"